Servers in a data center. 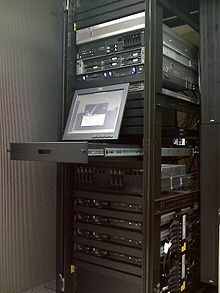 Several servers are mounted on a rack and connected to a KVM switch. A server is a system (software and suitable computer hardware) that responds to requests across a computer network to provide, or help to provide, a network service. Servers can be run on a dedicated computer, which is also often referred to as "the server", but many networked computers are capable of hosting servers. In many cases, a computer can provide several services and have several servers running. Servers often provide essential services across a network, either to private users inside a large organization or to public users via the Internet. Typical computing servers are database server, file server, mail server, print server, web server, gaming server, and application server. Numerous systems use this client / server networking model including Web sites and email services. An alternative model, peer-to-peer networking enables all computers to act as either a server or client as needed. The term server is used quite broadly in information technology. Despite the many server-branded products available (such as server versions of hardware, software or operating systems), in theory any computerised process that shares a resource to one or more client processes is a server. To illustrate this, take the common example of file sharing. While the existence of files on a machine does not classify it as a server, the mechanism that shares these files to clients by the operating system is the server. Similarly, consider a web server application (such as the multiplatform "Apache HTTP Server"). This web server software can be run on any capable computer. For example, while a laptop or personal computer is not typically known as a server, they can in these situations fulfill the role of one, and hence be labelled as one. It is, in this case, the machine's role that places it in the category of server. In the hardware sense, the word server typically designates computer models intended for hosting software applications under the heavy demand of a network environment. In this client–server configuration, one or more machines, either a computer or a computer appliance, share information with each other with one acting as a host for the other[s]. While nearly any personal computer is capable of acting as a network server, a dedicated server will contain features making it more suitable for production environments. These features may include a faster CPU, increased high-performance RAM, and increased storage capacity in the form of a larger or multiple hard drives. Servers also typically have reliability, availability and serviceability (RAS) and fault tolerance features, such as redundancy in power supplies, storage (as in RAID), and network connections. Servers became common in the early 1990s as businesses increasingly began using personal computers to provide services formerly hosted on larger mainframes or minicomputers. Early file servers housed multiple CD-ROM drives, which were used to host large database applications. Between the 1990s and 2000s an increase in the use of dedicated hardware saw the advent of self-contained server appliances. One well-known product is the Google Search Appliance, a unit that combines hardware and software in an out-of-the-box packaging. Also produced were the Cobalt Qube and the RaQ. Simpler examples of such appliances include switches, routers, gateways, and print servers, all of which are available in a near plug-and-play configuration. Modern operating systems such as Microsoft Windows or Linux distributions seem to be designed with a client–server architecture in mind. These operating systems attempt to abstract hardware, allowing a wide variety of software to work with components of the computer. In a sense, the operating system can be seen as serving hardware to the software, which in all but low-level programming languages must interact using an API. These operating systems may be able to run programs in the background called either services or daemons. Such programs, such as the abovementioned Apache HTTP Server software, may wait in a sleep state for their necessity to become apparent. Since any software that provides services can be called a server, modern personal computers can be seen as a forest of servers and clients operating in parallel. The Internet itself is also a forest of servers and clients. Merely requesting a web page from a few kilometers away involves satisfying a stack of protocols that involve many examples of hardware and software servers. The least of these are the routers, modems, domain name servers, and various other servers necessary to provide us the world wide web. The introduction of Cloud computing allows server storage and other resources to be shared in a pool and provides servers with a higher degree of fault tolerance. A rack-mountable server. Top cover removed to reveal the internal components. Hardware requirement for servers vary, depending on the server application. Absolute CPU speed is not quite as critical to a server as it is to a desktop machine. Servers' duties to provide service to many users over a network lead to different requirements such as fast network connections and high I/O throughout. Since servers are usually accessed over a network, they may run in headless mode without a monitor or input device. Processes that are not needed for the server's function are not used. Many servers do not have a graphical user interface (GUI) as it is unnecessary and consumes resources that could be allocated elsewhere. Similarly, audio and USB interfaces may be omitted. Servers often run for long periods without interruption and availability must often be very high, making hardware reliability and durability extremely important. Although servers can be built from commodity computer parts, mission-critical enterprise servers are ideally very fault tolerant and use specialized hardware with low failure rates in order to maximize uptime, for even a short-term failure can cost more than purchasing and installing the system. For example, it may take only a few minutes of down time at a national stock exchange to justify the expense of entirely replacing the system with something more reliable. Servers may incorporate faster, higher-capacity hard drives, larger computer fans or water cooling to help remove heat, and uninterruptible power supplies that ensure the servers continue to function in the event of a power failure. These components offer higher performance and reliability at a correspondingly higher price. Hardware redundancy—installing more than one instance of modules such as power supplies and hard disks arranged so that if one fails another is automatically available—is widely used. ECC memory devices that detect and correct errors are used; non-ECC memory is more likely to cause data corruption. To increase reliability, most servers use memory with error detection and correction, redundant disks, redundant power supplies and so on. Such components are also frequently hot swappable, allowing technicians to replace them on the running server without shutting it down. To prevent overheating, servers often have more powerful fans. As servers are usually administered by qualified system administrators, their operating systems are also more tuned for stability and performance than for user friendliness and ease of use, Linux taking a noticeably larger percentage than for desktop computers. As servers need a stable power supply, good Internet access, increased security and are also noisy, it is usual to store them in dedicated server centers or special rooms. This requires reducing the power consumption, as the extra energy used generates more heat thus causing the temperature in the room to exceed acceptable limits; hence normally, server rooms are equipped with air conditioning devices. Server casings are usually flat and wide (typically measured in "rack units"), adapted to store many devices next to each other in a server rack. Unlike ordinary computers, servers usually can be configured, powered up and down or rebooted remotely, using out-of-band management, typically based on IPMI. Many servers take quite a long time for the hardware to start up and load the operating system. Servers often do extensive pre-boot memory testing and verification and startup of remote management services. The hard drive controllers then start up banks of drives sequentially, rather than all at once, so as not to overload the power supply with startup surges, and afterwards they initiate RAID system pre-checks for correct operation of redundancy. It is common for a machine to take several minutes to start up, but it may not need restarting for months or years. Server-oriented operating systems can, in many cases, interact with hardware sensors to detect conditions such as overheating, processor and disk failure, and consequently alert an operator or take remedial measures themselves. Because servers must supply a restricted range of services to perhaps many users while a desktop computer must carry out a wide range of functions required by its user, the requirements of an operating system for a server are different from those of a desktop machine. While it is possible for an operating system to make a machine both provide services and respond quickly to the requirements of a user, it is common to use different operating systems on servers and desktop machines. Some operating systems are supplied in both server and desktop versions with similar user interface. Windows and Mac OS X server operating systems are deployed on a minority of servers, as are other proprietary mainframe operating systems, such as z/OS. The dominant operating systems among servers are UNIX-like open source distributions, such as those based on Linux and FreeBSD. The rise of the microprocessor-based server was facilitated by the development of Unix to run on the x86 microprocessor architecture. The Microsoft Windows family of operating systems also runs on x86 hardware and, since Windows NT, have been available in versions suitable for server use. While the role of server and desktop operating systems remains distinct, improvements in the reliability of both hardware and operating systems have blurred the distinction between the two classes. Today, many desktop and server operating systems share similar code bases, differing mostly in configuration. The shift towards web applications and middleware platforms has also lessened the demand for specialist application servers. In a general network environment the following types of servers may be found. Mobile Server, or Server on the Go is an Intel Xeon processor based server class laptop form factor computer. Sound server, provides multimedia broadcasting, streaming. Almost the entire structure of the Internet is based upon a client–server model. High-level root nameservers, DNS, and routers direct the traffic on the internet. There are millions of servers connected to the Internet, running continuously throughout the world. Virtually every action taken by an ordinary Internet user requires one or more interactions with one or more servers. There are also technologies that operate on an inter-server level. Other services do not use dedicated servers; for example peer-to-peer file sharing, some implementations of telephony (e.g. Skype), and supplying television programs to several users (e.g. Kontiki, SlingBox). In 2010, data centers (servers, cooling, and other electrical infrastructure) were responsible for 1.1-1.5% of electrical energy consumption worldwide and 1.7-2.2% in the United States. To put this in context, this is less than the 6 billion cell phones in the world use to recharge their batteries. Moreover, this pales in comparison to double-digit uses like heating and cooling, domestic hot water, ranges, ovens, and clothes dryers, to name a few. Finally, to keep this use in perspective, the Smart2020 report estimates that ICT (Information and Communications Technology) saves more than 5 times its carbon footprint in the rest of the economy by enabling efficiency. ^ Comer, Douglas E.; Stevens, David L. (1993). Vol III: Client-Server Programming and Applications. Internetworking with TCP/IP. Department of Computer Sciences, Purdue University, West Lafayette, IN 479: [[Prentice Hall]]. pp. 11d. ISBN 0-13-474222-2. ^ Li, Huang, Shen, Chu (2010). ""A Realistic Evaluation of Memory Hardware Errors and Software System Susceptibility". Usenix Annual Tech Conference 2010". ^ Siering, Peter (1993). "Paarige Premiere: Microsoft Windows NT 3.1 und Advanced Server". c't (11): 142 ff. ^ "SMART 2020: Enabling the low carbon economy in the information age". The Climate Group. 6 Oct 2008. Retrieved 18 Jan 2013. This page was last modified on 23 April 2014 at 22:39.